Food Adventures of a Comfort Cook: Stonefish Sushi and More is certainly more than expected. Stonefish Sushi and More is certainly more than expected. Walking into Stonefish Sushi, you're immediately greeted by an open atmosphere of feeling good; the decor is a perfect fusion of East meets West. It's the type of place you want to sit in for awhile, talking, eating, and just having a good time. The wait staff is very attentive, don't mind answering any questions, and make sure you are pleased. Happy hour(4:30 - 5:30)was in full swing when we walked in, and the place was 3/4 full. The tables are arranged along the walls, with cushions and pillows covering the bench that is against the wall, and chairs are in the main walking area. There is only a couple of feet between tables, so if you're looking for privacy, you won't accomplish that here. 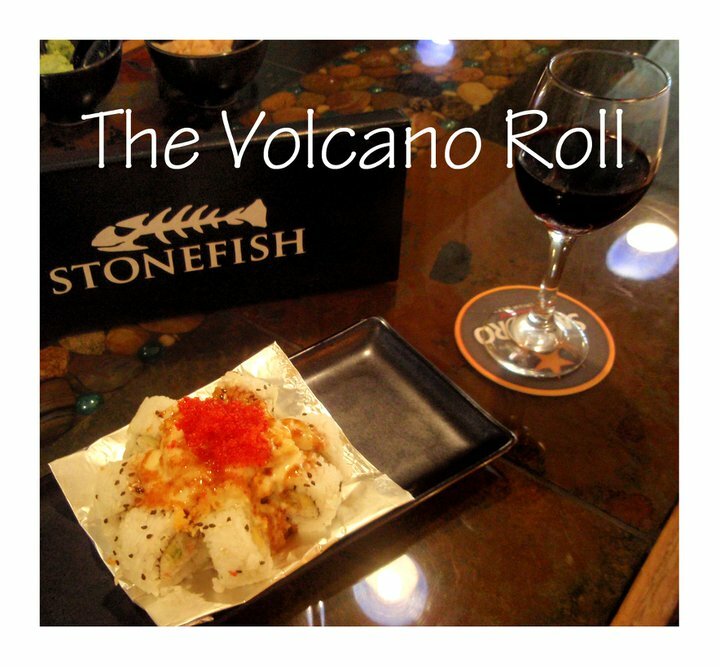 We ordered sake, Calamari dinner entree, Volcano and Vegas rolls. While we waited for our meal, we spied on the neighboring diners to see what they were eating, and how were they enjoying themselves. We also had the bar (duel duty of sushi bar and alcohol bar), and watched the two preparers work. The two guys preparing the sushi were working fast and hard to get the orders out; from what we saw of the plates coming out, the menu items looked fantastic. We heard comments of "oh, this looks so good"; "this tastes great! "; I swear, I believe one guy would have picked up his plate and licked it clean, if he could. First our Calamari arrived with a semi-spicy Thai sauce that was delectable; the Calamari, however, was a little disappointing; very thinly sliced and fried to such a crisp that it fell apart like potato chips. The pieces were difficult to pick up with chopsticks, dip and eat; most of the flavor came from the sauce. Ok, it was classified as a dinner item, but was more an appetizer. Next came the Volcano roll (avocado, cucumber, krab), and it was quite pretty to behold; and tasted wonderful. The pieces were uniform and fit perfectly in the mouth for that one bite sushi should be; the spicy lobster topping with roe was awesomely good. Then came the Vegas roll(salmon, avocado, cream cheese)lightly fried tempura style with spicy mayo and unagi sauce. OH MY!!! It melted in the mouth and was purely succulent; almost like an obscene dessert. Which brings me to dessert, and we tried the Green Tea ice cream. If you haven't tried this item before, beware, it is not your typical ice cream; not overly sweet, more of a savory nature, but you just can't put the spoon down and stop eating it. Overall...we can't wait to go back again, and try out some of the other menu items.